I recently published a piece in The Islamic Monthly about Muslim immigrants and refugees in South Korea. A good number of these Muslim immigrants to Korea are African, and East Africans have been at the forefront of pushing the boundaries of Korean refugee policies. For clarification, an immigrant chooses to leave their home country, often for improved economic opportunities. A refugee is forced to flee their home country out of fear of violence or persecution. An asylum seeker is a refugee who has officially applied for protection in the country that received them. South Korea has all of these. Much of the social stigma Muslim immigrants to South Korea experience is not unlike that Nigerians and other West Africans face when moving abroad. See below for the text of the article. I took Ramadan for granted when I lived within the diversity of New York. Even as a non-Muslim, it was a beautiful time of year. I remember the explosion of smell of cumin and curry wafting from family-owned restaurants just before sundown. I loved hearing the noisy laughter of families as they lingered over their Eid tables, allowing their playing children to stay up later than usual. It buoyed me to see posters reminding everyone to pay their zakat (alms) for the year to charities. The contemplation the holy month inspires in observers somehow made parts of the city more sober, yet also more joyful for the same reason. But after moving to South Korea last year, this Ramadan was a very different experience. There are so few practitioners of Islam here — Muslims comprise less than 0.5% of the population — that one must know how to search for acknowledgement of Ramadan at all. 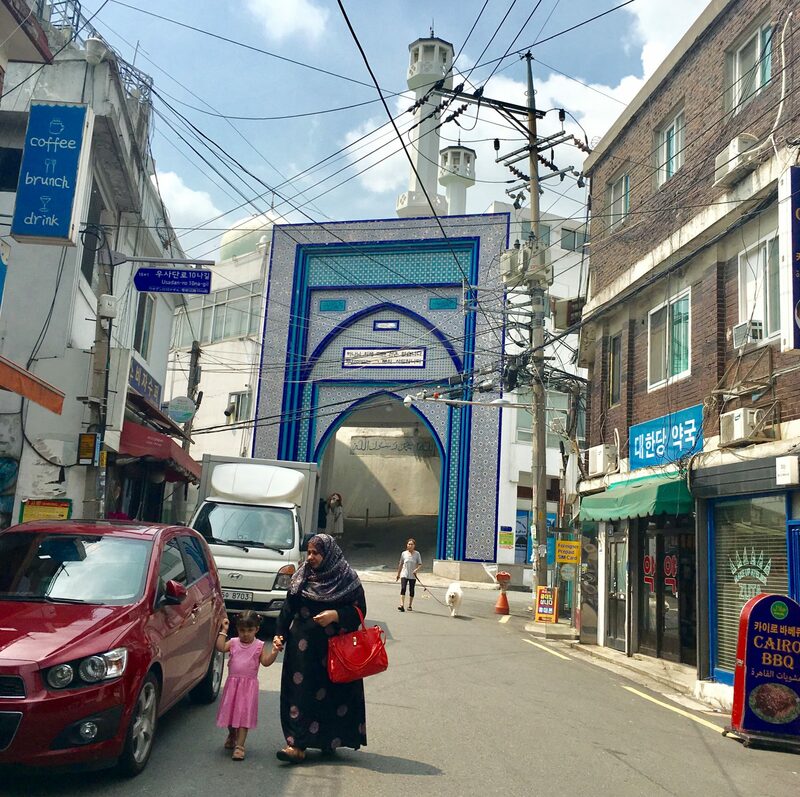 The small-but-growing Muslim community is largely centered in the capital, Seoul, on a hilly street hosting the Central Mosque and the core of Islamic culture for the country. The mosque is over-capacity each Friday, with worshipers sometimes laying their pray rugs on the sidewalk outside, an indicator of the slowly rising number of Muslim immigrants in the city. 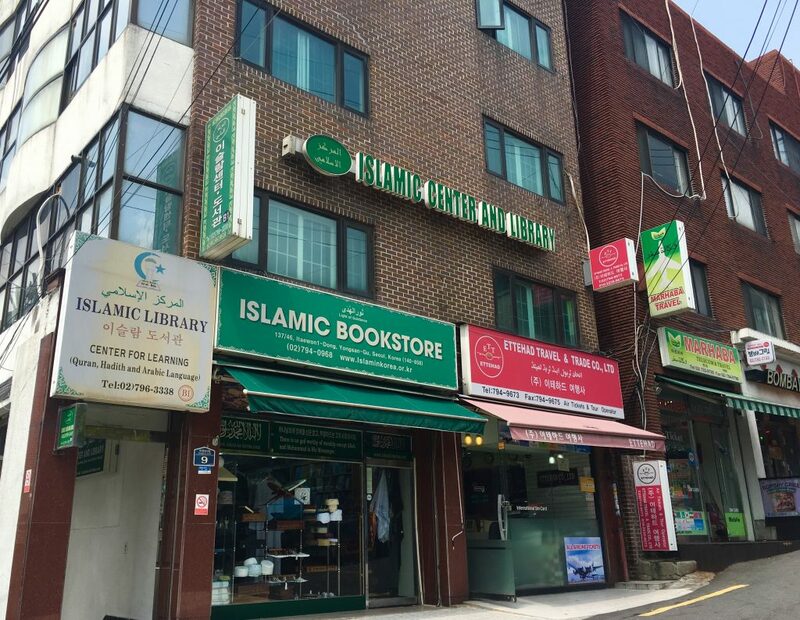 Seoul’s Muslims have created their community in the international Itaewon neighborhood, interestingly, right near the Yongsan U.S. Army base. A stroll up a colorful side street reveals halal restaurants and grocers, electronics stores, pilgrimage travel agencies, offices of immigration attorneys and cosmetics vendors. The range of Muslim immigrants is so great here that one can eat Malaysian-Egyptian food, exchange Thai baht for Emirati dirham and book a trip to Bahrain or Brunei. Some women wear gauzy shayla veils barely covering their hair, a few others a black niqab revealing only eyes. The street very much flows with the rhythm of daily prayer, and many of these doors are closed during salah (prayer) times, which I noticed confused some Korean visitors. “As-salaam alaykum” (peace be on you) is the most common greeting on this street, one I have seen embraced also by non-Muslims doing business here. There are Chinese tailors, Nigerian cell phone salesmen and Korean nail salons alongside these Muslim shops. They buy, sell and trade among each other. Many long-time Muslim residents — I spoke with Pakistanis who had been in Seoul for 20 years — speak Korean, and they benefit from and contribute to the local economy. Spending just a day on this peaceful street might lead a visitor to believe these Muslim immigrants have a solid foothold in South Korea. However, this religious minority must tread softly. I have written elsewhere about my outreach efforts to a local mosque here, which were not welcomed by mosque leadership. In better understanding the complicated terrain Muslims navigate in South Korea, I can appreciate the leadership’s defensiveness. I received a distant reception (admittedly due in part to language barrier) again when I recently visited the mosque to try to learn more about the history of Korean Muslims. I understand: They are trying to practice a marginalized religion in a country unaccustomed to diversity. The small number of Muslims in South Korea, and the country’s uncharted path to dealing with them, is precisely why the Muslim presence here is so intriguing. We read often of the unstoppable tide of Muslims migrating to Europe, but little of those who seek out developed countries with few practitioners of Islam at all. What follows is the background story of how Muslims experience this vulnerable social space in one of the most ethnically homogenous countries in the world. It also explores the inconsistent way in which the government approaches immigration, and a few of the factors influencing policies toward outsiders. South Korea struggles to maintain social harmony and economic prosperity in the face of unprecedented immigration, which is difficult. Who are the Muslims of South Korea? There are approximately 250,000 Muslims among a population of about 51 million, largely non-religious, South Koreans. A small fraction of these Muslims, up to 75,000, are ethnic Koreans born in the country. A spokesman at the Seoul Central Mosque says this number is even smaller, about 40,000. Middle Eastern traders and later Mongols introduced Islam to the Korean peninsula beginning in the 9th century. The greatest rise in the number of Korean Muslims occurred in the 20th century, after Koreans fled to Muslim areas of China to escape Japanese occupation, and later returned converted. At the same time, Turkish troops stationed by the United Nations during the Korean War had an Islamizing effect. Yet, there are three times more foreign-born Muslims than ethnic Korean ones, numbering about 150,000. These are Muslims living and working on that Itaewon street with the Central Mosque. There is a steady rise in Muslims each year in the form of foreign university students and Muslims staying in the country as they intermarry with Koreans. These spouses are from other Asian countries typically. These two groups have helped quadruple the number of Muslims in South Korea since 1994. Admittedly, the size of the Muslim population is challenging to verify because the government has not done a census on their numbers in five years, and just under 20% of Muslim immigrants are in the country illegally (an issue explored in the latter half of this article). The challenges begin for many Muslims upon arrival at Seoul’s Incheon airport. For hopeful Muslim refugees who don’t have all their necessary paperwork, some of whom stayed during a layover or traveled via a “safe” country, their arrival is a grim one. Hundreds of immigrants have been held at the airport in a space meant for 50, for up to six months at a time. These have included men from war-torn parts of Africa and Syria. During their weeks and months of wait, they are given three meals per day of only a hamburger or chicken burger with a soda. There are reports of devout Muslims living off just the bread to avoid non-halal meat. There are no beds, so they sleep on the floor. There are two showers, one for each gender. They take occasional walks through duty-free stores to look at goods they will never be able to afford. When the government announced plans to build a “Welcome Center,” a refugee housing facility called Young Jong Reception Center, nearby residents protested. They voiced concerns about a flood of immigrants and a rise in crime in the area, the general concern of many Koreans. This backlash was unsurprising to many. According to a 2013 WorldValues Survey,more than 1 in 3 South Koreans responded they didn’t want a neighbor of a different race. In trying to better understand the experiences of those who make it past the airport, I spoke with Aman Ullah Khan, a Pakistani Ph.D. candidate and a Korean-Urdu interpreter and translator who has been living in Seoul for almost five years. He described to me the challenges of practicing Islam in South Korea. In addition to rights protections, religious infrastructure is lacking in this largely secular society. While Muslim migrants account for two-thirds of all Muslims in South Korea, they make up over 90% of attendees at religious services — meaning immigrants are far more actively engaged in the religious community outside their homes than Koreans of any religion. Yet there are only about 15 mosques and 60 Islamic centers in the country. There is no Muslim cemetery, even for Korean Muslims, and there is a single halal chicken slaughterhouse run by a Pakistani-Korean. Yet for many, it is difficult to make the argument that South Korea has an obligation to meet the religious needs of foreigners, especially those who were not invited in the first place. Any public relations campaign for foreign Muslims in South Korea would be a challenge. In addition to a pervasive desire for sameness-based harmony, Koreans have reacted strongly to reports of Islamic violence. There was the 2004 decapitation of a Korean missionary in Iraq, then the 2007 kidnapping of Korean missionaries in Afghanistan. South Korean news was flooded with reports in 2015 of an 18-year-old Korean man who traveled to Turkey, a post-exam gift from his mother, and then purportedly disappeared into Syria to join ISIS. Last year, it was widely reported that ISIS hackers had gained information to attack U.S. military bases in South Korea. These incidents have fueled the notion of the “Islamic terrorist.” Islamophobia is as prevalent in South Korea as anywhere in the West. Khan is certainly not the typical Muslim in South Korea. Even a cursory glance at population statistics demonstrates that the country does not open its doors to immigrants, and it certainly doesn’t do so for Muslim refugees from the Middle East or Africa. Although South Korea legally could begin accepting refugees in 1994, it didn’t take in the first one, an Ethiopian, until 2001. As of August 2015, only 600 non-ethnic Korean refugees have been legally admitted, out of 18,800 applicants. This makes South Korea’s refugee acceptance rate 3% to 4% overall. In 2014 alone, the U.S., a close ally, accepted 745 refugees for each one that South Korea did — 70,000 by Washington compared with 94 by Seoul. South Korea has the highest denial rate of refugee applications in Asia, after Japan. Here is the rub with asylum applications in places like South Korea: Applicants are given a small stipend to live on while their cases are evaluated and are not permitted to work for up to six months while awaiting approval. If they do work, they are deemed an employment migrant. These people are seen as exploiting the asylum application system. However, what applicant from Africa, the Middle East or South Asia shows up to a country of possible refuge with enough supplemental money for six months? The system puts applicants in a position in which they need to find illegal work, but then uses that illegal work as proof that they really only came to South Korea for employment, not safety. The application can then be denied. Khan, in his interpretation work for the High Court, estimates that 99% of immigration appeals are denied. “Those who appeal never win,” he says. Indeed, 2015 was the first year that an asylum seeker won an appeal to even have his asylum case reviewed, after the Immigration Authority had refused to process his application because he had been in the country over a year. Ha Yong-guk, a Justice Ministry official, reported that 4 out of every 10 people who applied for asylum last year did so while staying in the country illegally. It is understandable that a government doesn’t sympathize with an illegal immigrant, but it is this same government that constructs the laws that make this immigrant an illegal one to begin with. Simply put, foreign wars don’t wait for domestic bureaucrats. A visitor to Seoul, however, doesn’t need these numbers. Even a day riding on the metro system shows how few foreigners are allowed into the country. South Korean notions of immigration, specifically of refugee seekers, are still focused on an outdated ideology of anti-communism. During the Cold War, the United Nations High Commissioner for Refugees was mostly concerned with those fleeing communist countries to seek asylum in the West. Refugee protections were expanded in the past decades to cover those forced from home due to violence and war. The UNHCR’s convention, which South Korea ratified in 1992, has moved past this 20th-century Cold War perspective while South Korea has not. This disadvantages Arab and African Muslims who do not come from socialist or communist states. The country readily accepts defectors from North Korea (as it should), but denies the urgency and relevancy of other immigration cases. However, here is the contradiction. South Korea actually has one of the most progressive immigration laws in Asia. The Law on the Status and Treatment of Refugees, or the Refugee Act, enacted in 2012, was the first set of refugee protections separate from general immigration laws in East Asia. The Refugee Act allows for refugee applications on arrival at the airport, bans deportation until a final decision is made and allows the applicant to work after six months if no decision is made. It is a vast improvement on immigration laws that were in place before, but Korean refugee activists argue it is still not nearly comprehensive enough to protect the thousands of refugees who arrive each year. Yet it was a clear step forward considering how South Korea came to have such closed borders to non-White immigrants to begin with. A country ready for refugees? By exploring the Korean perspective, and the perspective of countries like it, we can better understand its tightly secured borders. There are historical, economic and cultural reasons why the government strives to firmly control incomers from developing countries, particularly those from a minority religion. Here are questions to ask when considering why some populations of developed countries may be hesitant to accept refugees and other immigrants. How long has this country been dealing with immigration issues? We need to consider the level of experience a country has with integrating refugees. WWII forced Europe and the U.S. to resettle Jews, Roma and other displaced people, and they have been doing so for over 70 years. The current refugee crisis with Muslims, especially out of the Middle East, has been ongoing for five years, perhaps longer if one also considers East African civil wars. In fact, until the democratic transition of the 1980s, South Korea was an origin country of refugees, rather than a recipient. South Korea simply hasn’t had decades of practice with immigrants. How long has this country been a developed one? South Korea is extraordinary in the speed with which it pulled itself out of poverty in a single generation. After the Korean War ended in 1953, South Korea had a GDP and per capita income similar to that of North Korea. South Koreans labored with great intensity, sacrificing even individual liberties to meet economic goals, and turned their country into a fully developed one within about 40 years. They did this without bountiful natural resources or helpful border neighbors. Based on the work ethic of today’s pensioners, who can still remember childhoods of food insecurity, South Korea is now one of the Four Asian Tiger economies (along with Hong Kong, Singapore and Taiwan). Those pensioners, and the country as a whole, are understandably slow to share that hard-earned prosperity with outsiders. The collective memory of poverty still lingers. How do the people believe the country came to be developed? South Korean society is based on harmony, and many see Muslim refugees as a threat to that harmony. The country struggles to overcome its emphasis on racial purity, minjok, and only within the past few years were such concepts removed in writing from schools and the military. Its only experience with non-Koreans was the brutal Japanese occupation, a traumatic one that contributed to an aversion to outside ethnicities. In addition to racial attitudes, some Koreans fear that current social welfare systems are not sufficient to support refugees. Social welfare programs are not as expansive as one might expect based on the country’s wealth, perhaps since unemployment is only a significant problem among youth and familial ties are often strong enough to support those who would otherwise seek government help. Some worry that if immigrants couldn’t support themselves, perhaps they would turn to crime. The rate of stranger-on-stranger crime is low in South Korea, and citizens understandably want to keep it that way. What do the government and the people fear most? Many countries in South Korea’s position, developed but not yet home to many outsiders, have a clear anxiety about a flood of immigrants. Most pressingly, an inundation of refugees from North Korea would be highly problematic for Seoul. It’s easiest for governments like these to deny asylum applications as much as possible. As an admirer of South Korea, I have thought about how the country could change its policy to benefit from the rapid increase in Muslim immigrants. There is a population gap due to low birth rates. Maybe accepting refugees could bolster the number of employees in low-skilled jobs? The country will need 15 million immigrants in the coming years to maintain the balance of the labor force. Koreans have an appetite for English. Perhaps immigrants could contribute to an increase in English acquisition among the population as they seek a common language? As the economy continues to grow, it will need to expand its reach of trading partners. Could taking in Muslim refugees help do this, and increase goodwill with countries in the Middle East? I don’t believe immigration is a zero-sum game in which taking in a refugee means fewer resources for a citizen. Here is the challenge for newly developed countries like South Korea, trying to maintain the population status quo: A government can’t both seek to be a global player and then close its borders to global forces. One of the realities of being a developed country is that people from underdeveloped countries will try to come to build a better life. So, the best course of action is to create policies and infrastructure that galvanize the power of immigrants advantageously. In these times of unprecedented migratory patterns, developed countries can do their best to keep outsiders away for only so long. No government can avoid refugees in the 21st century because they’re “not their problem.” Refugees are everyone’s problem. 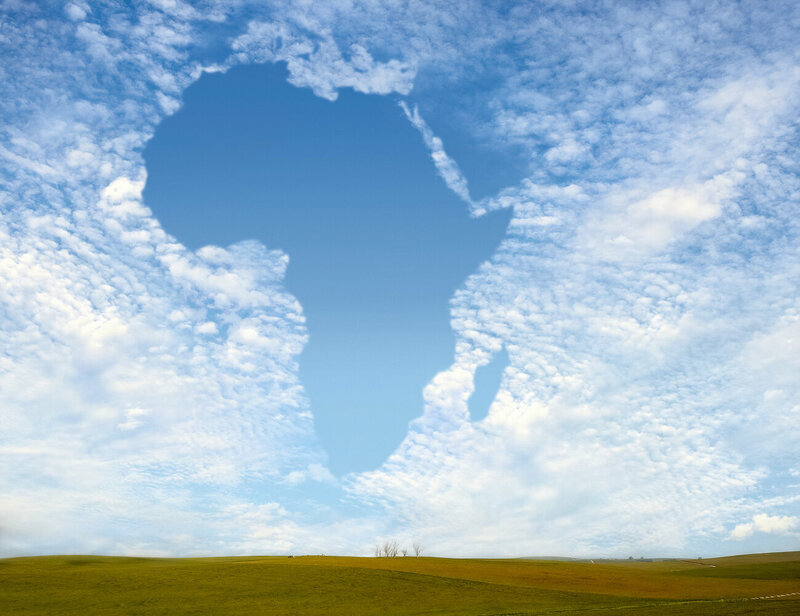 The African Global Economic and Development Summit took place at the University of Southern California from March 16th to 18th. None of the approximately 60 invited guests from Africa were able to attend. The problem was that none of the African delegates were able to get U.S. visas. Humphrey Mutaasa from the mayor’s office in Kampala, Uganda, had organized a delegation of 11 business leaders from Uganda to attend the African Global Economic and Development Summit at the University of Southern California. He says it was a very high level group of leaders from private businesses, the Ugandan ministry of trade, chambers of commerce and the Kampala mayor’s office. “The delegation that was coming from Uganda to that summit was very, very disappointed,” he says. The conference was first held in 2013 and seeks to strengthen business ties between U.S. investors and African companies, says summit chairwoman Mary Flowers. Visa problems have been an issue before, she says. In the past, she says roughly 40 percent of African invitees are unable to get the papers they need to attend, mainly due to a combination of red tape and bureaucracy. It’s hard to find out exactly why. Delegations were invited from 12 countries across the continent. None of them were from the three African nations (Libya, Somalia and Sudan) covered by President Trump’s executive order temporarily banning travel from 6 majority Muslim countries. Flowers speculates new vetting procedures put in place by the Trump administration are discriminating against travelers from Africa. “Obviously because this has never happened before,” she says of the inability of anyone to come. The White House has called for “enhanced screening and vetting of applications for visas” worldwide as part of stepped up efforts to keep out terrorists. A State Department official on background tells NPR that they can’t comment on any individual visa applications but says all applications are screened on a case-by-case basis. And the eligibility requirements for getting a visa haven’t changed. Some of the African delegates to the summit say their visa applications were denied because they didn’t show a compelling reason why they would return home after the event. Others say bureaucratic hurdles were so big that they were not able to submit a visa application in the first place. Humphrey Mutaasa in Kampala says the online application is complicated. You can’t even see how long the process will take until after you’ve paid a $160 application fee at a local bank. Then you have to wait a day to get a confirmation code to book an interview at the U.S. embassy. Which meant he wouldn’t have a ruling on his visa until after the three day conference had concluded. The end result of this year’s visa outcome, says Flowers, is going to be fewer connections between American business and the continent.